ProM Lite 1.1 is a release for end users (see the Release Notes for details). ProM Lite only contains the most typical packages, it will only show the most typical plug-ins, and it allows to user to select whether to install new packages and/or updates when starting. In contrast with the regular releases, updates to the packages of the ProM Lite release are possible (as are new packages, if need be). As a result, ProM Lite should not be used to refer to in any publication. ProM Lite is a moving target, and any update may invalidate scientific results obtained using it. If you need ot refer to ProM from any publication, refer to the latest regular release (in this case, ProM 6.6). Run ProM Lite 1.1 when you have access to the internet. All required packages will be downloaded installed automatically, Afterwards, ProM needs to check all downloaded packages for plug-ins. This may take some time, please be patient. Run ProM Lite 1.1 when you have access to the internet. When starting, ProM will check whether there are any new packages and/or updates. If so, it will ask whether to install them. If yes, it will install them, after which it needs to check the new downloaded packages for plug-ins. This may take some time, please be patient. On Windows, you can do this by double-clicking the ProMLite11.bat file in the folder where you have installed ProM Lite 1.1. On Linux and Mac OS X, you can do this by starting a shell or terminal, going to the folder where you have unpacked the archive, and by running the ProMLite11.sh file. On Mac OS X, please do not double click the PromLite11.sh file, as this starts Xcode to edit the file instead of running it. 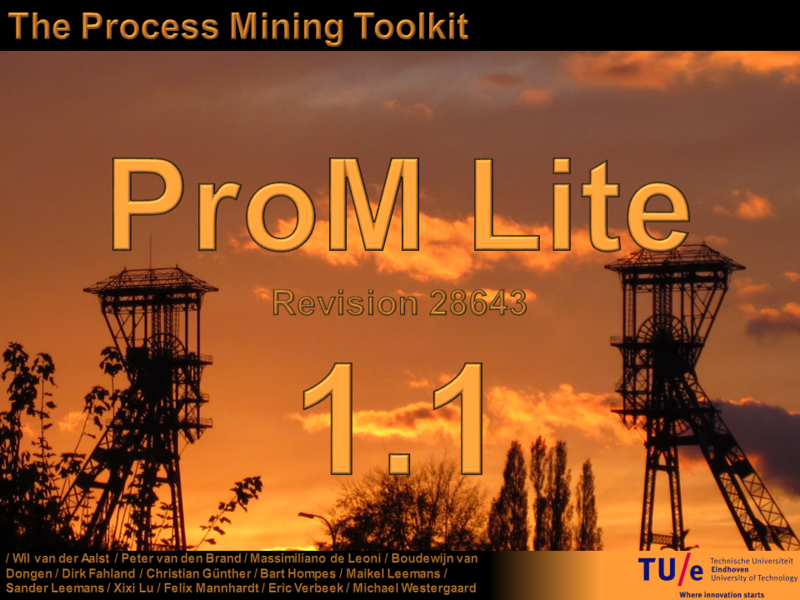 Users of ProM Lite (“Alum”) will automatically use the packages from ProM Lite 1.1.